Despite all the flashy technological innovations and apps that emerge on a seemingly daily basis, email marketing remains one of the most effective methods of delivering brand messaging to ultimately drive prospects down the sales funnel. In this post, I would like to explore some recent email marketing research that supports several effective email components and strategies. A recent survey by MessageSystems revealed that email marketing is consumers’ preferred method of receiving brand communications. This preference indicates high potential for new sales through email marketing. Like most aspects of digital marketing, there is no one guaranteed pathway to email marketing success. The multitude of email service providers, formats, content strategies, and features available to marketers makes analytics monitoring and experimentation imperative components to successful email campaigns. Moreover, any business’s email marketing campaigns must factor in brand DNA, target audience personas, and industry relevance while aligning with its content marketing strategy. For help choosing which email marketing service provider is right for your business, check out Captera’s Reviews of Top Email Marketing Software Products. 33% of email recipients open email based on subject line alone – so be prepared to spend some time creating powerful subject lines for your messages. Remember to explicitly reveal what is contained within the email with clear, actionable language. Unsurprisingly, subject lines that contained terms such as “ROI,” “asset,” and “industry” have historically low open rates, so avoid using “common biz jargon” & spammy language. Get creative! For more details on writing killer subject lines, check out Hubspot’s Anatomy of a 5 Star Subject Line. For even more tips, and some sweet examples of effective email subject lines, check out this Article from The Best Of Email. Before sending a marketing email, answer the question: “Who would want to read this email and why?” Clarify your email’s value proposition early and indicate its relevance to the recipient – and do so briefly! Hubspot also reports that click through rates drop dramatically for emails with bodies longer than 300 characters. Personalization of content has been a major emerging theme for digital marketing, and unsurprisingly it improves email click through rates by 14%. 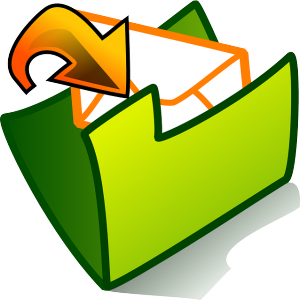 A “personalized” email is addressed to an individual recipient and includes content that is relevant to them. In order to personalize your emails, segment your mailing list based on the recipients’ demographics/personas and activities (i.e. a content engagement, purchase behavior, etc.) and/or stage in the sales cycle. Afterwards develop custom, targeted content for each segment – regularly varying the types of content you send (hint: videos can lead to a 3x increase in email click through rates!). Your email content should also include clear calls to action that both provide value to your recipients and move them forward on their pathway to purchase. These emails are directly from my personal inbox – note the relevance to past purchase behavior (GoPro & Panera) and to my passion for outdoors/fitness/adventure (Outside & Liftopia). According to Hubspot’s Email Science of 2014, a majority of consumers prefer image-based emails vs text heavy emails, so make sure each email you send prominently features graphics that are both attention grabbing and relevant to the email’s subject matter. Be sure to incorporate your company’s branding into your emails’ aesthetic design, and don’t to overwhelm your recipients with too many images – keep them organized and easy on the eyes. These features should be self-intuitive – lead prospects to your digital content, and make it easy for them to amplify your marketing materials! Include links to your company’s website, social media profiles, blog, apps, etc. Make it easy for your unqualified and disinterested prospects to identify themselves by giving them a clear option to opt out of email communications. Failure to include an opt out option can also get your business in legal trouble (see Can Spam Law), so don’t forget it! You can also setup your unsubscribe landing page to include a “unsubscribe survey” to gain insight about why readers no longer wish to receive your emails. 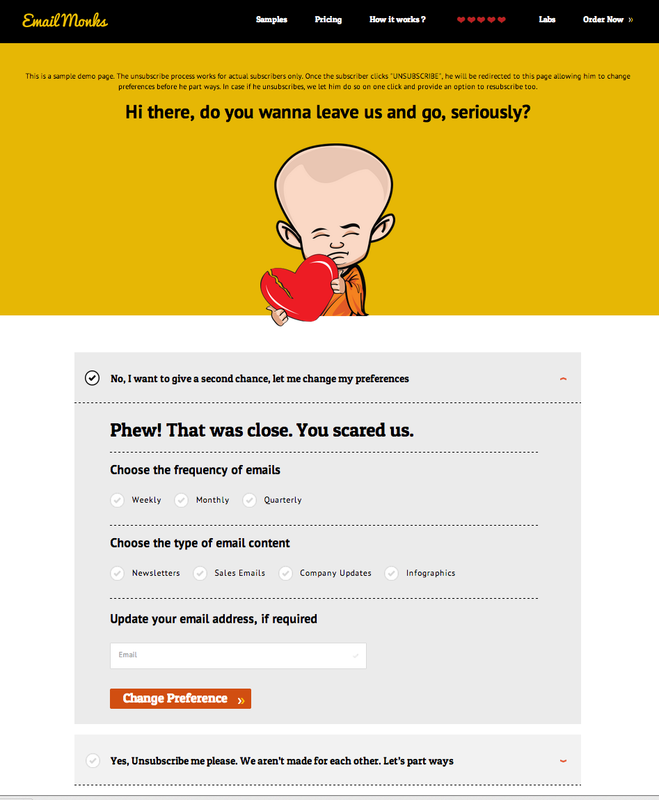 EmailMonks has an awesome unsubscribe landing page to emulate (below). Gone are the days where the world read email solely through various desktop programs – Litmus reports that mobile now accounts for 51% of all email opens, and that 61% of webmail users open email on their mobile devices. It is therefore critical to ensure that your emails are viewable in optimal format across both devices and operating systems. Choose an design approach for your emails (Scalable, Fluid, or Responsive) and be sure to apply the same design to your landing pages! Minimize the amount of zooming and scrolling required for your viewers to keep their online experience with your brand easy and positive. 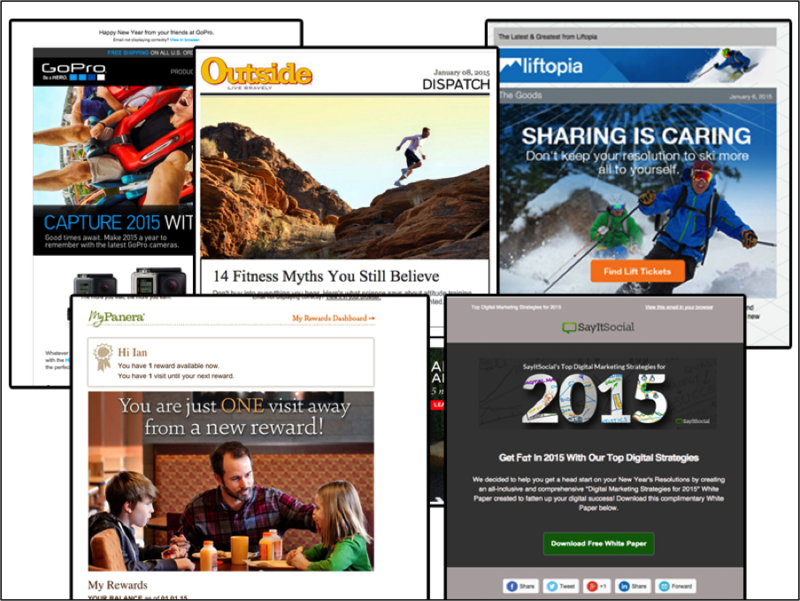 Some Email Marketing service providers, such as MailChimp (pictured here) have built in mobile responsive design capabilities. Use A/B testing to determine what kind of content and formatting your audience responds to most, as well as what time of week generates the highest open & click through rates. Again, self-explanatory. If you want to improve the effectiveness of your email marketing efforts, you need solid analytics to guide your adjustments. 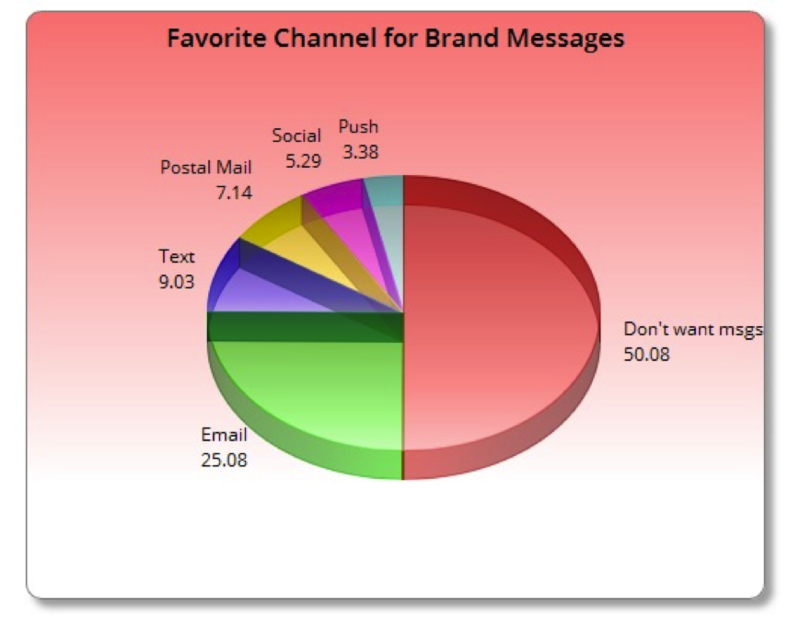 Check out EConsultancy’s 16 Most Important KPI’s for Email Marketing for more info. Still having trouble staying out of your prospects’ trash folders? Give us a shout! The only thing we love more than digital strategy is talking about digital strategy.